"Mom." 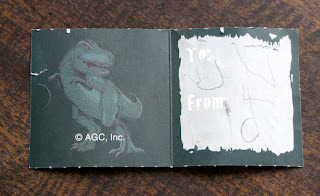 Holds up a dinosaur Valentine card from almost two years ago. "Why does this pterosaur look less like a dinosaur, and more like a bird?" "Oh. I think I should give this card to Lundi." We were on our way to see her in an hour or so. "Oh, I am sure she would appreciate that. Do you want me to help you write her name on it?" "Okay, we can sit right here." "mmm, how 'bout I just give it to her?" "Well, the thing is about cards Bub, is that they're made special when people give them to you with your name on it, and sign their name. I mean, it means so much more to people if it's written on, than if you just hand it over to them." "Oh. How 'bout you write it?" "Well, I could, but really, if it's a note to tell her that she's special to you, it would be made more special if you wrote her name." When he first saw her at Grammy's, he said a bit shyly, "Oh, hi, Lundi, it's so nice to see you again." and then "I have something for you...."
This is very touching....I hope she appreciates it. I would hate for Lundi to be the first girl to ever break his heart.